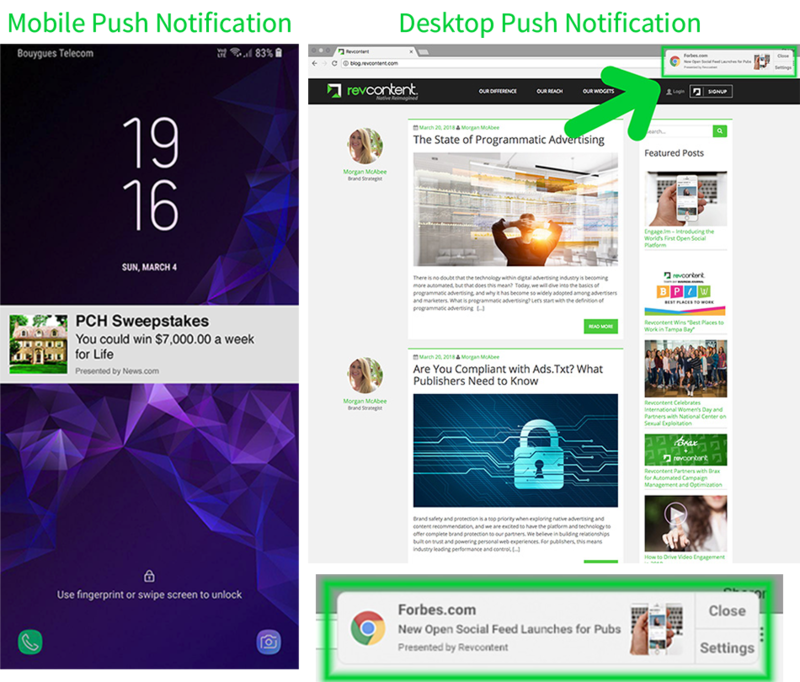 Push notification traffic offers a highly engaging new funnel of impressions to advertisers via 100% user opted-in traffic to natively designed website/app notifications on desktop and mobile devices. There are over 300mm impressions available daily from push notification traffic within Revcontent’s network and growing daily as publishers continue to launch this traffic type. How Does Push Notification Traffic Work? Advertisers who want to target push notifications exclusively should create separate boosts optimized for this traffic. As these placement vary from traditional widgets, we have created best practices for boosts targeting this traffic to ensure maximum engagement and optimal performance. While the system allows you to input up to 80 characters, headlines for push notification traffic are limited to only 40 characters -- longer headlines will be cut off. While we generally recommend uploading content at a 4:3 image ratio, 1:1 is preferred for push notification traffic. Images should be as simple as possible. Hint: Logos work great! Creatives for push notification traffic are smaller than those served on standard widgets. Images that are too busy will be hard to distinguish when served at a reduced size. Add (PUSH) to the beginning of your boost name. We recommend a minimum starting budget of $500. Adjust your bid appropriately for this traffic. We recommend bidding 20 - 30 % lower than your typical CPC to acquire these clicks. Utilize our Push Notification Whitelist Targeting Template available in Revcontent’s Targeting Templates. Create a new boost or clone your boost by selecting the Clone action. Ex. Country and Region Targeting, Language Targeting, ect. In the settings tab of your New or Cloned boost, choose to target ALL Topics, Include, or Exclude specific topics. You can search for the Push Notification channels by searching for “push” in the drop down list. From the Targeting tab of your boost, you can enable or disable topic targets by toggling the ON/OFF switch on the right hand side. You can also update your bid for specific channels, by double clicking on the Max CPC Bid of the topic. To apply our Push Notification Template, navigate to the Targeting tab of your boost. Select Widget Optimization to access the Widget Optimizer. To Segment/Target this traffic, select Target Only from the drop down list. Select the Push Notification (Target) template from the drop down list. Choosing Target Only will ONLY serve your boost content on our Push Notification traffic type. If you are not interested in receiving traffic from Push Notifications, you have the ability to block this traffic type. To do so, select Blacklist from the drop down list. Then, select Push Notifications (Blacklist) from the Template drop down list. Choosing Blacklist will serve your boost content throughout the network EXCEPT the Push Notification traffic type.